Most of the time Spring Onion is used in cooking to add taste to a dish. There are even certain foods which we tend to cook with onion to enhance the flavour. 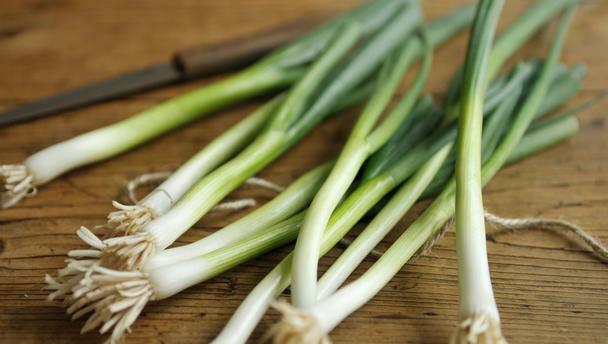 Spring Onion not only adds taste to food but is also a very convenient herb in Chinese medicine to be used for certain health problems. Chinese medicine considers that people can get a cold throughout all the seasons of the year, however, in certain seasons the cause and symptoms will vary. This is because the external pathogenic factor is different and when it invades the body it causes a different type of cold. In the Winter, the common cause of the cold is pathogenic wind and cold. Therefore the principle of the treatment is to expel the wind and the cold. We suggest eating foods or herbal formulas with warm, mild spicy flavours which can help the body to expel the wind and cold, and bring the body back to a healthy, balanced condition. Spring Onion is one of the foods we can use for this. Runny nose, sneezing, headache, sore throat, cough, body feels cold or cold hands & feet, aversion to cold, aching in the body/joints/muscles, tired, no perspiration (symptoms will vary depending on how long you’ve had the Cold and its severity). One of the Traditional Chinese Herbal Medicine books, Ben Cao Jin Shu, recorded that Spring Onion is mildly spicy in taste and warm in nature and can help the body to expel the wind and the cold. It is very useful in the beginning (first or second day) of the Winter Cold. I suggest drinking Spring Onion & ginger tea – see the recipe below. If it is a serious Cold, you can drink this tea in conjunction with your treatment to help clear the symptoms. Somebody who has cold hands, cold feet, aversion to cold and heaviness on the body because their circulation is sluggish and their Yang and Qi is weaker, the symptoms are especially worse in the Winter or on cold days. For this condition, I also suggest drinking a certain amount of the Spring Onion & ginger tea, or add more ginger to the cooking to improve your circulation. Boil ingredients together in 2 cups of water for 2-3 minutes. Strain Spring Onion & Ginger pieces – slowly drink decoction while warm. Expel pathogenic wind and cold; warm the body; relieve symptoms of early stage Winter Cold. You can drink 1 or 2 cups of this tea per day when you are sick with Winter Cold or irregularly when needed. Spring Onion can be eaten raw or cooked, mixed in with other foods, not only to balance the food but also the body. i) If you feel your body may already contain heat (increased thirst & perspiration, constipation or feeling hot), avoid Spring Onion. ii) If you are not sure whether Spring Onion is suitable for you, consult your experienced Traditional Chinese health practitioner.